U.S. District Judge Edward Chen in San Francisco granted a request for a preliminary injunction against the administration’s decision to discontinue temporary protected status for people from Sudan, Nicaragua, Haiti and El Salvador. It’s the latest case in which judges have cited Trump’s own comments to rule against his immigration policies. His words have been turned against him in lawsuits over decisions to separate families at the border, end legal protections for young immigrants and ban people from some Muslim-majority countries. 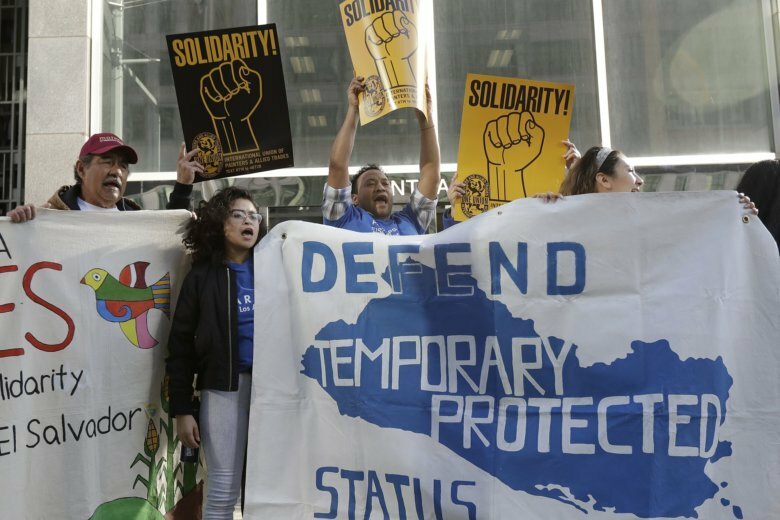 The ruling said the government failed to show the harm of continuing the 20-year-old program and that the plaintiffs established how uprooting those immigrants could hurt the local and national economy. “Beneficiaries who have lived, worked, and raised families in the United States (many for more than a decade), will be subject to removal,” Chen wrote. Many have children who were born in the U.S. and may be faced with the choice of “bringing their children with them (and tearing them away from the only country and community they have known) or splitting their families apart,” the ruling said. The lawsuit from immigrants who have received the protections alleges the administration’s decision was motivated by racism. “The Justice Department completely rejects the notion that the White House or the Department of Homeland Security did anything improper. We will continue to fight for the integrity of our immigration laws and our national security,” O’Malley’s statement said. Attorneys for the plaintiffs praised the ruling and issued statements from some of those involved. Chen questioned the administration’s motives at a hearing last month. He cited a memo that he said suggested the decision was driven by the administration’s America First policy. He asked an attorney for the U.S. Justice Department to respond to plaintiffs’ allegations that America First meant excluding immigrants who are not white. Adam Kirschner, a government attorney, said the memo showed then-Homeland Security Acting Secretary Elaine Duke grappling with what to do about temporary protected status. Kirschner said input from the White House was expected on an issue like this, but the final decision was Duke’s. Chen repeated Trump’s vulgar comment about African countries while responding that any influence the White House had on Duke could be relevant to the claims that the administration’s moves were discriminatory. El Salvador was designated for the program in 2001 after an earthquake, and the country’s status was repeatedly renewed. The Trump administration announced in January that the program would expire for El Salvador in September 2019. The administration concluded that El Salvador had received significant international aid to recover from the earthquake, and homes, schools and hospitals there had been rebuilt. The Trump administration ended the program for the other three countries as well. Jablon reported from Los Angeles.